(Reuters) - Venezuela's state-run oil company PDVSA is seeking to sidestep Trump administration sanctions restricting payments for its oil by asking major buyers, including U.S. refiners, to renegotiate contracts, four sources involved in the talks said. The U.S. government issued an executive order on Monday freezing PDVSA assets and requiring U.S. firms to pay for PDVSA oil using accounts controlled by the country's congress head and self-proclaimed president Juan Guaido. The sanctions were aimed at pressuring socialist President Nicolas Maduro into stepping down. PDVSA began calling customers ahead of the sanctions, urging them to swap foreign fuel and other products for its Venezuelan crude cargoes, the sources said. It is also considering asking trading houses to act as intermediaries for a portion of its oil sales to indirectly supply customers in the United States and elsewhere. "We are trying to redo the contracts. It is not yet entirely clear how because customers are being individually called, but we are studying alternatives," said a PDVSA source familiar with the efforts. It was unclear on Tuesday whether the approach of using intermediaries or swaps would avoid violating U.S. sanctions, the sources said. Oil accounts for more than 90 percent of Venezuela's export revenue. Falling output, corruption and mismanagement have battered the nation's economy, leading to hyperinflation and malnutrition that have prompted some 3 million people to leave the country. The South American country exports 1.25 million barrels per day (bpd) of crude, including 500,000 bpd to the United States, and imports over 200,000 bpd of refined products, according to Refinitiv Eikon data. The imports from the United States are crucial for Venezuela's production of diluted crude oil (DCO), as they use heavy naphtha to dilute Venezuela's extra heavy crude and produce oil ready for export. Industry traders on Tuesday said that U.S. refineries were making inquiries to replace those shipments from other countries. World oil futures rose by more than 2 percent on Tuesday, but the market has not seen panicked buying as a result of the U.S. decision to target Venezuela's oil output, particularly as the country's production was already near seven-decade lows. Washington said on Monday proceeds from PDVSA's sales to companies in the United States will be frozen until a new government can take control of the accounts. The sanctions did not directly mention swaps and indirect trade with PDVSA that began in recent years with customers including PDVSA's U.S. unit Citgo Petroleum, India's Reliance and Russia's Rosneft. Oil firms that had sent tankers to Venezuela to lift crude bound for the United States were ordered by PDVSA on Monday to pay for cargoes before departure, sources told Reuters. But such prepayment could violate the sanctions, setting the stage for a standoff at Venezuelan ports. Regular buyers of Venezuelan crude, especially in the United States, have started hunting for alternative supplies of heavy oil, a difficult task as other Latin American exporters from Mexico to Colombia do not have surplus capacity. Several U.S. refiners, including Chevron Corp, Phillips 66 and Valero Energy said they were studying the sanctions and would comply with U.S. laws. Valero, the second-largest buyer of Venezuelan crude after Citgo, said it will "re-optimize" its crude supply. Washington's fast action on Venezuela and efforts by Maduro's government to defend its grip on PDVSA have sent shockwaves around the world, triggering angry responses from China and Russia. Swaps and three-way trades have become routine due to PDVSA's oil-for-loan pacts and U.S. sanctions first imposed in 2017, according to internal PDVSA documents and trading sources. The Caracas-based company's barrels typically go through several hands before reaching a refinery. Its fuel imports mostly come from swaps, according to PDVSA's internal documents and Refinitiv Eikon data. PDVSA approached an Indian refiner seeking to modify terms of its contracts, including adding partial payment in the form of refined products through swaps, a source from the refining company said. With other customers, payments in medicines or food for settling outstanding balances also are on the table, one of the PDVSA sources said. India's Reliance and Nayara Energy, partially owned by Rosneft, did not respond to emails requesting comment. Swaps are one response to U.S. sanctions, but dealing with traders for triangulating Venezuelan oil sales could be PDVSA's last resort as intermediaries make a profit from buying cheap barrels, storing them and then offering them to refiners. 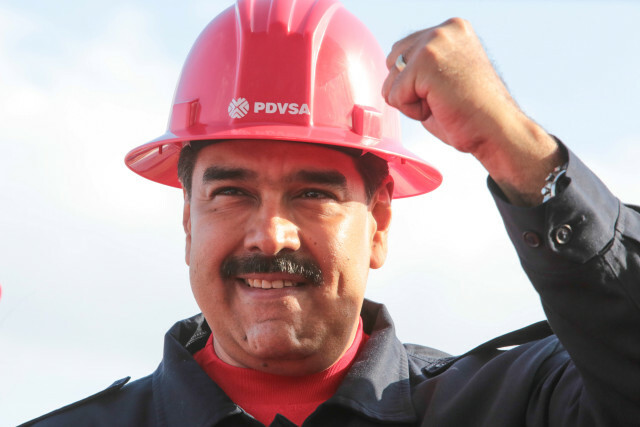 "Traders buy our oil at obscene prices," the PDVSA source said.